Yes, there is a pot of gold at the end of that rainbow. And the good news is, there's regularly scheduled train service in the North Bay that will take you there. You will need no ticket if you wish to ride this train, but it might help to wear green, and have a bit of imagination—and tons and tons of patience. No, this is not the SMART train. It's a little model train that runs on a shelf on the wall in back of the counter at the Santa Rosa main post office. 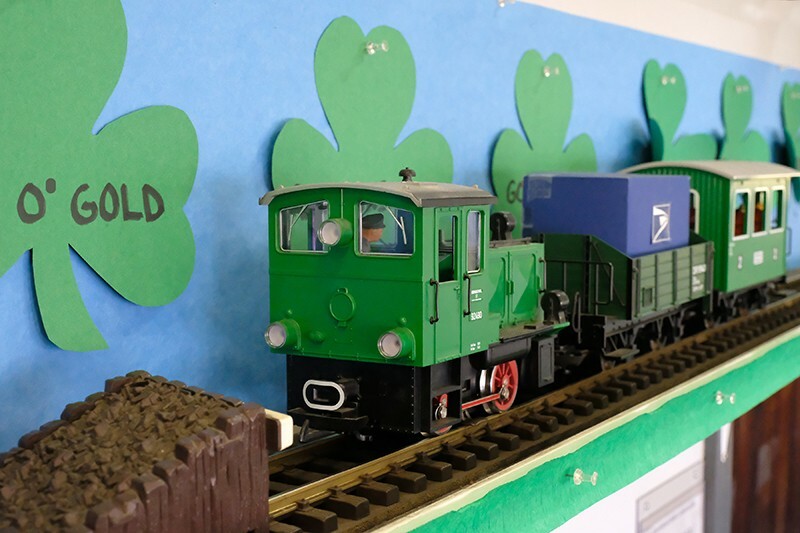 March's theme is St. Patrick's Day, you see, and the train runs between a coterie of suspected leprechauns and its terminus at the pot of gold, pauses for a very suspenseful several seconds, then pulls out of the station for the return trip, eight feet down the line. That's pretty much all it does. But this is the post office, and it's the best entertainment going, as clerks disappear into the cavernous back room and the line grows longer, besides a new video screen that shows off all the wonderful mailing options at the post office. The rail baron behind this dear little narrow gauge is a retired postal carrier who comes back each month with a new train and new stops to mark seasonal or whimsical themes like Valentine's Day, summer in the city and good old Peanuts. Now if only there were a bar car in there somewhere, it'd help pass the time in this post office line . . . 730 Second St., Santa Rosa.—J.K. I'm not a churchgoer, but I've got a new favorite place of reverence: the Jenner Headlands Preserve. The newly opened property inspires a feeling of both belonging and insignificance. Rising from a small parking lot (come early if you want a spot) off Highway 1 just north of Jenner, the preserve's signature sea-to-sky trail travels 7.5 miles through a succession of ecosystems—coastal prairie, oak woodland, redwoods—to arrive a few hours later atop Pole Mountain, the highest point in western Sonoma County. If you're not up for that trek, there are shorter routes. In any case, it doesn't take long to ascend up the hillside and earn a magnificent vista of Pacific Ocean, the Russian River, Point Reyes to the south, Fort Ross and a succession of rugged vistas to the north. It's the mic-drop of views in Sonoma County. Get out of the house and get your family up there, and get right with the world.—S.H. We millennial nerds have many fond childhood memories: Magic: The Gathering, Tamagotchis, Animorphs (or Goosebumps, if that was your thing) books . . . And then there were video games. At Nostalgia Alley in Petaluma, owners Jason Moorhouse and Rebecca Anderson have set out to create a video-game store that caters to both adults recapturing their youth and Fortnite-obsessed kids, who should expand their gaming horizons. "In the few months we have been open, it is so great to see kids come in eager with their Christmas money and walk out with their first Gameboy or Nintendo 64," Anderson says of the store's first holiday season. When customers aren't buying or selling games, they can spend a quarter (or 10) playing one of seven refurbished arcade cabinets. And before leaving, don't forget to give Jasper, "the world's best one-eyed Papillon, and a great store mascot," a scratch behind the ears. 36 Petaluma Blvd. N., Petaluma. 707.774.6485.—T.B. His name is Brian. But when he was alive, the conspicuously dead horse was known as Mr. Dancer. The handsomely preserved equine skeleton is a resident—and arguably one of the most popular staff members—at Santa Rosa Junior College's Shone Farm, a 365-acre outdoor learning laboratory, operated by the College's ag department. The working farm (located in the center of the Dry Creek Valley area between Windsor and Forestville) boasts a vineyard and winery, a forest with hiking trails and the Warren G. Dutton Agriculture Pavilion, containing a full horse arena, a large industrial kitchen and numerous classrooms. That's where students interact with Brian. According to pavilion manager Chris Wills, Brian is a thoroughbred, foaled in 1989. Named Mr. Dancer, he was donated to the U.S. Parks Police Department in Washington, D.C. That was in 1993, when Mr. Dancer was just four years old. Used for public appearances, he participated in many state functions, including presidential inaugurations (presumably those of George W. Bush and Barack Obama). Mr. Dancer died in 2014, from what Willis calls "complications of an injury from another horse." 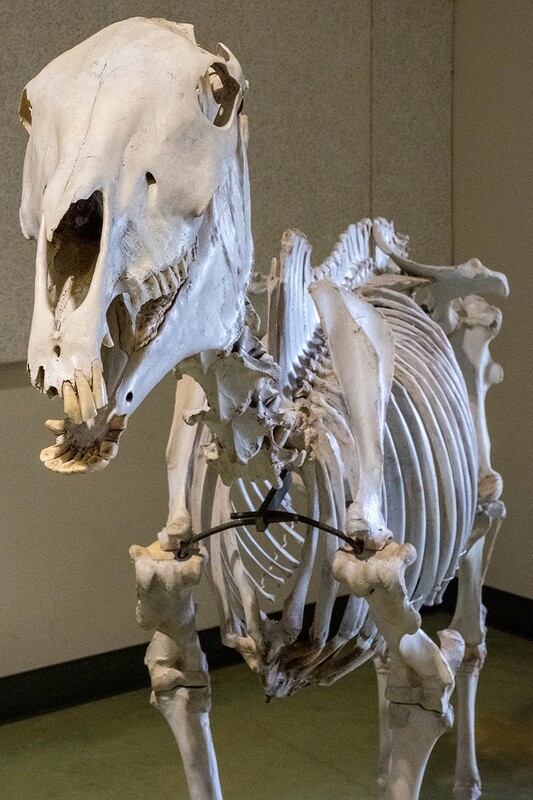 A year later, his skeleton was brought to SRJC courtesy of a New York business with the succinct and clear name of Equine Skeletons. At some point, he was renamed "Brian." He certainly looks like a Brian. "Brian is used in livestock and equine classes regularly," says Wills, "and provides a hands-on resource for the study of equine anatomy. Brian has also been known to dress up for Halloween and the Fourth of July, and he is a wonderful addition to the Shone Farm staff." shonefarm.santarosa.edu.—D.T.